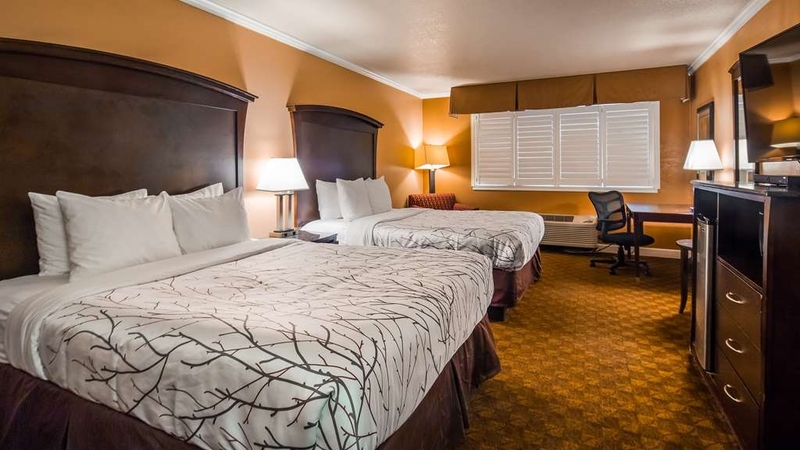 The Best Western Orchard Inn is ideally located in the center of Ukiah. Come and experience our hotel near the major tourist attractions. Best price guaranteed and exclusive deals. Your cozy Ukiah hotel is in the heart of wine country where all of the bounty and beauty of California is at your fingertips. The wineries and vineyards are the reason most people come to our Ukiah hotel. Close to historic downtown Ukiah and several shopping centers, there is plenty in the neighborhood to entertain the entire family. Family-friendly events take priority here, but that doesn't mean there aren't options for some adult-only fun. We're also close to casinos so you can see how Lady Luck is faring. Come for the wine tasting and stay for the car shows. There's always something happening near this Ukiah hotel. Infuse a little cultural sightseeing into your trip by strolling around the neighborhood. If you prefer to work on your swing, there's a golf course nearby. Water recreation is a favorite spring and summer pastime. You'll find yourself in the greenest winery area in the country. Easy access off of Highway 101 means that you're never far from the beach for a scenic drive or sandcastle building. 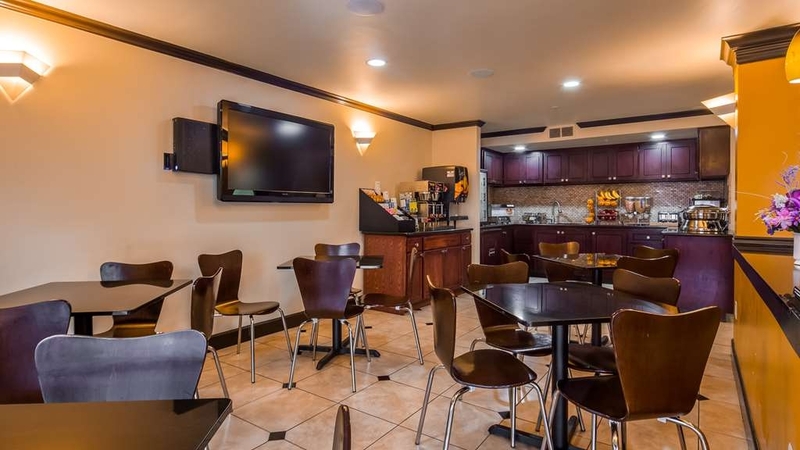 Free Wi-Fi and a complimentary hot breakfast sweetens the deal. Fill up on sizzling hot waffles and eggs, pastries, fruit, cereal, yogurt and 100% Arabica coffee. 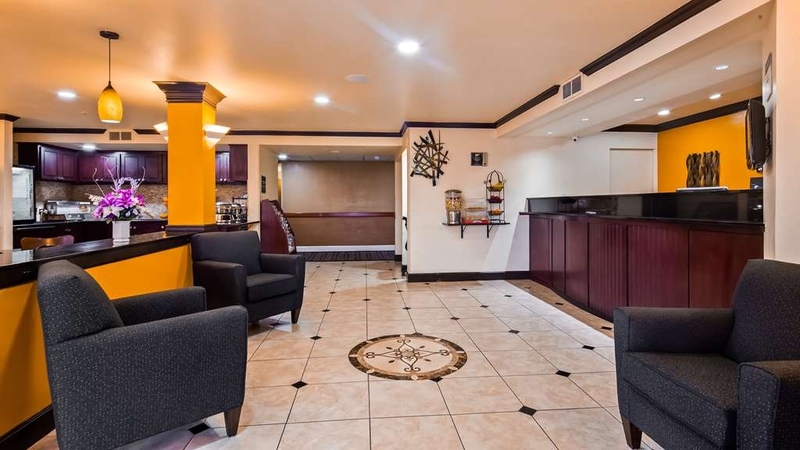 Business travelers enjoy the plethora of activities and relaxation available at this Ukiah hotel. Caltrans, PG&E and AT&T are a few companies nearby. Ukiah also has several breweries to visit if that's your poison. Enjoy a generous dose of pleasure mixed in with your business. 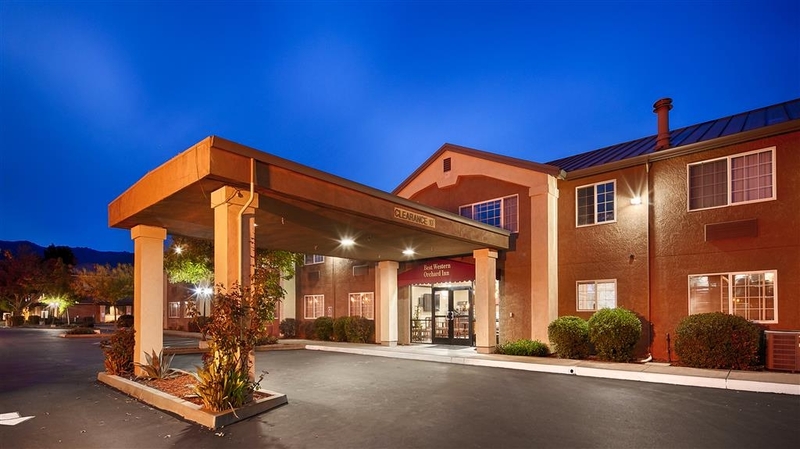 This Ukiah hotel is only two hours north of the San Francisco Bay area if you need some big city living. We're also close to Lake Mendocino, so bring the entire family. This pet-friendly hotel welcomes fur babies. Whether you need to be near the full 18-hole golf course or government offices, this is an ideal location. No hotel near Ukiah wineries does it better. 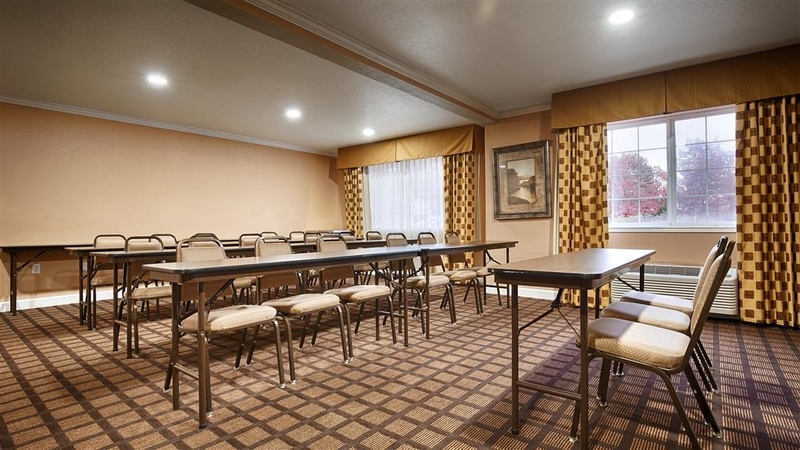 Reserve your next vacation at Best Western Orchard Inn and start planning your itinerary so you don't miss out on anything! This hotel needs updates. Broken slats in our window, coffee pot broken. Coffee in lobby was undrinkable.Staff was nice and the town was really cute. Room was clean. Would have given it a. 3 if things weren't broken. "Nasty, Disgusting, Stinky, Ran down !" Do not stay in this hotel ! Absolutely disgusting, The whole facility stunk of cigarette smoke. Room was filthy dirty. Screens in the windows were torn most of the way out.The carpet was so nasty you almost could not see the pattern anymore.Pool and hot tub were full of leaves,debries, and green slime. The breakfast was horrible. 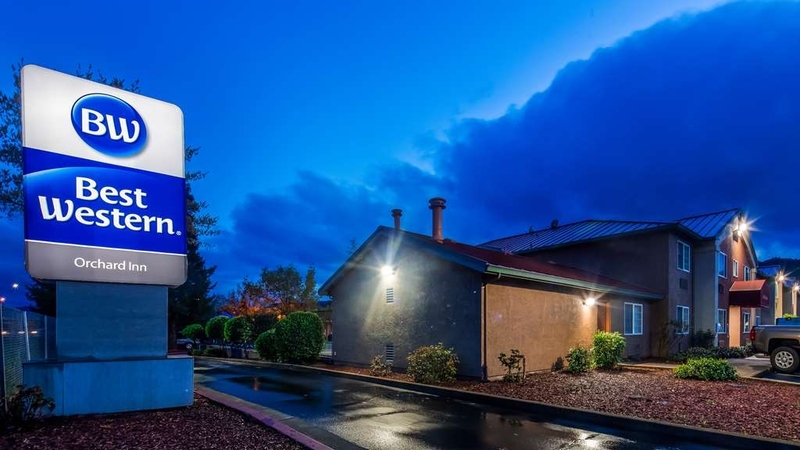 "Great Stay in Ukiah CA"
We had a great stay at the Best Western Ukiah right off the 101. Rooms were very comfy and clean. The staff was great. Every team member was welcoming and kind..always greeting us with a warm hello, good morning, evening, etc.. They kept the kitchen stocked with food all morning...breakfast was great with oh so many options. Definitely enjoyed our stay and will return. We stayed two nights at Best Western Orchard Inn. The room was large and the bed was firm. The room was clean but the maid had forgotten to empty one of the trash cans. Breakfast was better than their peers but they need to provide more gluten free options. Almond1212, Thank you for taking the time to share your experience! I regret to hear that you weren't impressed with the surrounding environment. Rest assured that there will be no harm that will come to our guest as we ensure strict security for everyone's safety. Please keep us in mind for your next stay in the area. "Rooms Smells Like Cat Urine"
My room had the strong odor of CAT URINE. Gross. GM didn't seem to think it was a problem. I chose this hotel because it had 3 stars, which seems to be the highest star rating in Ukiah. It should be a 1 Star. betsiebob, I am so sorry that you smelled of urine in your room. In the future please address immediately so that our staff will clean and disinfecting to restore the clean smell of our accommodations. Thank you for bringing this matter to our attention so that we can make sure no future guest experiences the same inconvenience. Odyssey21157895588. Thank you so much for taking the time to leave such a thorough and insightful review regarding the lighting, walls and suggestions to improve the experience for our valued guests in the future. Know that your voice is important to us and that we are working hard to address these issues and improve upon the guest experience. We will address the maintenance task right away for the benefit of our future guests, which hopefully will include yourself. Comfortable and clean room. Good bed and pillow, Nice, helpful staff. Good breakfast. The room was roomy, the breakfast area can be a little cramped but functional. A very good experience. Located close to restaurants. I recommend this Best Western and the local Ukiah brewery with it's excellent beer and unexpectedly great food. impens13, Thank you for your kind comments regarding our high standards of cleanliness and were able to provide you a comfortable experience. Your compliment to our bed, pillows and breakfast service means a lot to us. We are overjoyed to hear that you had a great time with us and we are looking forward to your next visit! lukeelrod95, Thank you for taking the time to let us know how you enjoyed your stay of Best Western Orchard Inn Hotel. Your compliments to our hardworking staff mean a lot to us. We look forward to serving you again and giving you another five star experience. ianmck2018, Thank you for sharing how you have enjoyed our friendly hospitality and accommodations. I am thrilled to know we have met your expectations and to know our location worked well for your plans. We are very happy to learn that your stay was so peaceful, and we hope to see you again. We've been staying at Best Westerns for a few years, and have come to expect slight variety in quality, which is no big deal. But this property fell far below our expectation for this chain. It started going down hill from check in- the young lady who checked us in was unfriendly and extremely slow. We had reserved the room through corporate and used our reward points. When we arrived we were given a ground floor room and the toilet leaked, a lot, on first use. We called the front desk and were told there was no maintenance person until the next day so we would have to move rooms. We then had to wait an hour to see if the last remaining ground floor room was reserved (how did the young lady at the front desk not know? ) Alas, an hour later after my wife went to the front desk to check, our family of four had to schlep our luggage upstairs. We arrived in the upstairs room which still smelled of stale smoke. Once settled in I went to turn on the TV, which of course didn't work until I plugged in the HDMI cable. Breakfast the next morning? Burned faux eggs, rubbery sausages, and old tasting tater tots, definitely not a breakfast of champions. And, just like the night before the lady at the front desk seemed unfriendly. Even "good morning" would've been appreciated. It was a disappointing last night of vacation, to say the least. I hope some time and energy are put into updating the property (easy location to find) and customer experience (everyone can have a bad day, but 2 different employees at 2 different times? ) so future travelers can have a better stay. d y, Thank you for sharing your experience, and I'm sorry to learn that you did not fully enjoy the breakfast service, accommodations and hospitality that we hold to such a high degree of importance in our hotel. We are dedicated to ensuring that you receive the highest level of service and your feedback will help us to correct and improve our accommodations and amenities to better achieve this determined goal. Hope that you will consider staying with us again so that we can have another chance to provide you with a superior experience. This might be the worst BW I've stayed in. The room smelled and was stuffy, repairs were cheaply done, and the breakfast - why serve this as a breakfast. I hope other locations have kept up their quality. zoltanm758, I am so sorry that you smelled of unpleasant in your room. In the future please address immediately so that our staff will clean and disinfecting to restore the clean smell of our accommodations. Thank you for bringing this matter to our attention so that we can make sure no future guest experiences the same inconvenience. Nice and clean hotel rooms are nice and up to date. showed up and they offered me free wine and told me that I also get free breakfast in the morning!!! So like I said I'm happy with my purchase ?????? James H, Thank you for taking the time to let us know how you enjoyed your stay of Best Western Orchard Inn Hotel. We seek to give each guest a very comfortable and accommodating experience and we are thrilled to hear of our success in this ambition. We're glad you had a good time with us and Our team will be waiting for your next return for another well-deserved break. This hotel is not in immediate proximity to shopping or dining facilities. Having very limited mobility, I found this hotel to apparently have no ADA rooms available. My wife was having thyroid surgery and we found navigating the area difficult. yatesfamily08, Your review and rating of our hotel mean a lot to us, and we thank you for taking the time to share this experience. I regret to hear that you weren't thoroughly impressed with the location of our hotel. I hope that this will not deter you from enjoying our accommodations and services in the future. "Free bottle of wine "
I was satisfied with my purchase at the best western orchard inn in Turlock!!! I showed up and they offered me free wine and told me that I also get free breakfast in the morning!!! So like I said I'm happy with my purchase. Ryan H, Thank you for letting us know how impressed you were with our service of Best Western Orchard Inn Hotel. I am so happy that you enjoyed your stay and that you found the accommodations and service to be satisfactory. We can't begin to tell you how much we appreciate your five star review, and we can't wait to serve you again! Checked in just for the night. The person at the desk was helpful and gave us a great recommendation for a nearby restaurant. Has fridge, microwave, TV. Would have been quiet if we didn't have a mini traveler with us. Free cookies and breakfast. Easy to get to off of get 101. Easy parking. This hotel is well managed and maintained by Ron. He is super friendly and the rooms are very comfortable. I have stayed on this property on occasions and have never had a bad experience. I highly recommend this hotel and plan on staying there again in the future. Was a great place, the services was on point. My favorite part of checking in though were the cookies! Baked on premises! The room was large and clean. breakfast was plentiful, exactly what you need to get the day started. Thanks again for a great stay Orchard Inn! Thanks to Ron, the Check in Clerk and Breakfast Attendant for letting us check in early and paying attention to detail the next morning during Breakfast. He even made my mom a restaurant style pancake as he likes to call it. The Rooms are Clean and have a large T.V with a outdoor Jacuzzi. I would recommend everyone to stay here as everybody at the hotel is always smiling. This was a great place for the value. great staff. Had an expanded breakfast, speedy check in and clean spacious rooms. The staff was excellent and very helpful on recommendations around town. Everything you need not far from the hotel. "If It Could Go Wrong It Did"
From check in to check out this hotel was a nightmare. The one thing it had going for it was the fact that the laundry room was available 24 hours a day. Lets see where to begin: the toilet ran without fail every 30 seconds, we tried to turn it off but when we had to use it the pipes began to shake like they were going to break, the shower had missing tiles, one of the machines in the workout room was broken, the bed was uncomfortable, the breakfast was very continental, the woman at check in was busy with some guy keeping her company, the woman at check out didn't care that we had problems in our room, ie, the toilet, when we did the customer satisfaction survey the manager sent us a generic please come back and were sorry for anything that went wrong letter. The toilet is something that housekeeping should have been able to hear had they been listening as it never stopped. This entire property was poor, please do yourself a favor and stay anywhere else.This hotel was terrible, we will never stay here again. We stayed on 12/9/17. Enjoyed our stay. The staff was very helpful and nice. The room was clean and the beds were comfortable. It was a bit pricey for the area, but the cleanliness and comfort were worth it. We had two rooms for a family of six and were all happy with our stay. Would stay here again. Very dirty carpet and room. Common area doors, mucked up with grease and gunk. Door to room, handle greasy, sticky with sweat or who knows what. Carpet dark stained, sticky, like someone or something spilled or crapped on carpet. Room stinky. Had to go to local store, buy can of room freshener in order to hide smell of dank odor. Mattress like sleeping on a piece of plywood. "One night in Ukiah "
Nice BW Hotel in Ukiah . The rooms are clean and comfortable. The Hotel is next to HWY 101, but you don't hear that in the rooms because of window shutters and blinds, I kept my a/c fan running all night to drown out noises . The beds are comfortable and warm, the room has a remodeled look, and the food at breakfast is delicious, Hot and cold full breakfast with the usual fixings. Staff is friendly and helpful. There's a McDonald's right down the street and a Denny's near by. I stayed here every week since July for business. It's a pretty standard hotel with the basics. The staff is always friendly and helpful. My complaints would be the rooms always smelled like they were drenched in bleach and also someone had smoked in them even though I always got a “non smoking” room. I had my “do not disturb” sign up and three separate occasions the maids still knocked and entered twice. They knew I complained and gave me dirty looks every time I stayed here which was uncomfortable. Kendal was the only reason I continued to stay at this hotel. She had outstanding customer service, always solved my issues, and was quick to apologize for others faults. However, I was never offered compensation or a discount for any Inconviences, which was surprising for how often I stayed at this hotel and was considered a “loyal” customer but no problem. All in all of you're staying for a night or two it's not a bad place to stay. "We were evacuated due to fire"
We were evacuated due to a wild fire near my house. The staff was supportive and helpful during an extremely stressful time. The hotel was comfortable, the breakfast was excellent. It was nice to have fruit, coffee, cookies, etc available all day. The staff even found some items I left in the wrong place (by accident). I stayed here for 2 nights while having to testify in town at the Mendocino Court as a non party witness. Please don't ask for a late checkout.... they are totally inflexible. Court is in recess at noon and I asked for a 1pm check out in order to have a sanctuary to rest for 30 mins at lunch. I was told it's not policy and that the last person that asked was charged another night. Obviously this property's manager is not out to get repeat customers.... I won't be back. Many broken items, lacking in general cleanliness and my room reeked of Pot. The staff (except for the guy who fixed my lock on my room that died and had me locked out) were not very friendly. The only reason I stayed here and not where the rest of the wedding party stayed was because they promised adjoining rooms for my 3 underage kids and myself and they did not honor that. To be fair this would have been an OK nite if the neighbors had not been noisy, but their behavior high lighted some of the buildings deficiencies like thin walls, noisy plumbing and self closing door hinges that slam the doors. The staff did move us to a second room to get away from the crack heads which was appreciated, but I think it was to a room that they used for breaks. The beds while made looked laid on, there was the ripe smell of perfume and garbage in the trash can. A PLUS - Has multiple electric car charging stations. Bed is rock hard, like sleeping on the floor. Nothing to hang onto in bathroom (for older travelers). Breakfast okay but get there early as selection diminishes and staff will not replenish after 9:00 a.m.
"Boring but not TOO gross"
Could have been a lot nicer since it's the same price as the Marriott, but it's just Marriott overflow so I got what I was expecting. I saw brown stains on the towels and the cleaning staff were eager to clear out the rooms on a Sunday... must have been expecting a huge booking on Monday. I would recommend this hotel, easy freeway access, comfortable beds, and decent breakfast. Near by breweries and and easy parking, helpful staff. Room was clean and had good cable channels, would stay here again. .
My son and I stayed here after his football game. It was very clean, large rooms with comfortable beds. The pool is located close to the highway so it is VERY loud. The breakfast was ok, nothing special but they did have eggs, sausage and bacon which my son loved. Not much of a fruit selection. Good, although somewhat ordinary place to stay. Rooms are clean. Bathroom is extremely small. Location is not near major business areas although there is a small shopping area withing walking distance. This motel is motorcycle friendly..
"Travels in Mendocino and Lake counties"
Ukiah stop over after traveling into Mendocino National Forest near Lake Pillsbury, hooking up with family members. I then decided to explore the amenities around and in Ukiah, Ca. I rediscovered the Ukiah Brewing Company which had food and music besides speciality brews. A great Ukiah stop. B. "Don't let the proximity to the freeway fool you"
While the hotel is right next to HWY 101, and on the outside, it's very loud, when you are in the room, it's not possible to hear the traffic. Besides that, the pillows and bed are the most comfortable I had at a hotel in many months. Additionally, the staff here are friendly and inviting, but not at all intrusive. Our room cost more than it should have. Its right next to the freeway so ask for a room at the far side away from it. They tried to fancy up the eggs by adding way too much bell peppers,maybe also onion, I`m not sure because we had to eat else where cause we didn`t like that addition. The baseboard in the bathroom was black with mold. YUK! The staff were all very nice!! Feces on wall in bathroom and smoke in a nonsmoking room . The manager was not in that morning when I checked out. The clerk was very helpful and connected me using her own phone to call him. They did not charge me for the room after all and try to rectify the situation . "Not what we expected from a Best Western property." 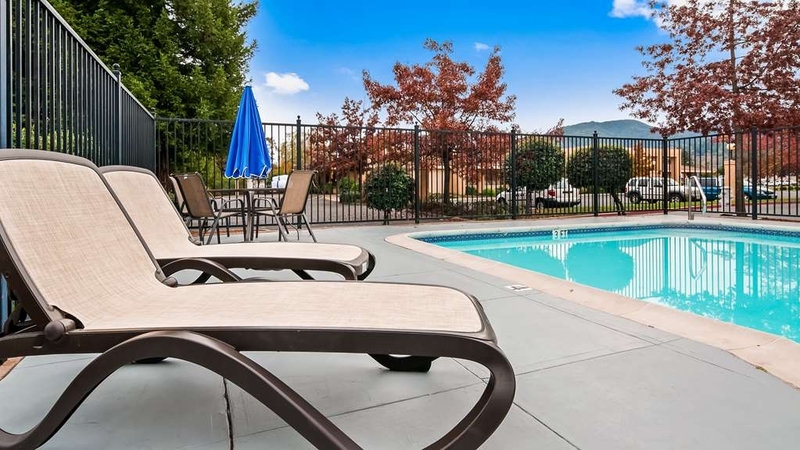 "Great place to stay in Ukiah Ca." I have stayed at Best Westerns before and been fine, but this is a terrible hotel. The bathroom flooded and was never repaired, my credit card was charged 4 times (I'm still trying to get this fixed) and I was locked out of my room because they said the card was declined, even though the room was prepaid. The front desk staff was nowhere to be found at check-in, and overall the hotel was dirty. I was staying there for business but will NEVER stay at this hotel again. The rooms are nicely decorated but lacking in maintenance. 1st room we checked into, the toilet was leaking badly from the seal at the base. I didn't notice until I stepped onto a sopping wet carpet....GROSS. I called front desk and they said the would move me so I packed up again and moved to 2nd room, this room had a tissue stuck in the peep hole it was obviously broken. I told desk as we left. We used the pool only to find there was no towels so I had to walk to front desk sopping wet to get towels. This Best Western was disgusting. My wife and checked in and we went to our room # 203. The first thing we noticed in this room was the musty smell. Then many stains on floor and bedding. I used the bathroom and after washing my hands I went to dry them. Well the towel I picked up had a wonderful red stain on it that looked to me to be blood. I immediately went to the front desk and asked for a clean room. My wife and I then were given keys to room #210. This room didn't have the musty smell but the carpets and bedding still stained and disgusting. Upon using the shower facilities I noticed a huge amount of mold all over the shower curtain. I then began to really look at this room. The room was filthy! I have stayed in Best Westerns from Southern California all the way to Redding and a few in other states as well. It is my choice hotel and never hesitate to book at a Best Western when ever there is one in the location I am traveling. This hotel was a completely appalling, as I hold a high standard for Best Western Hotels due to my experiences at a large number of them. But I mean seriously even the Bible I removed from the draw was filthy!! "Oder - Musty - Mildew Smell is all 4 rooms"
Not sure how a hotel can get away with oder - musty - mildew smell in all 4 rooms. Stay here only if there is nothing left in town. Staff are friendly and nice. 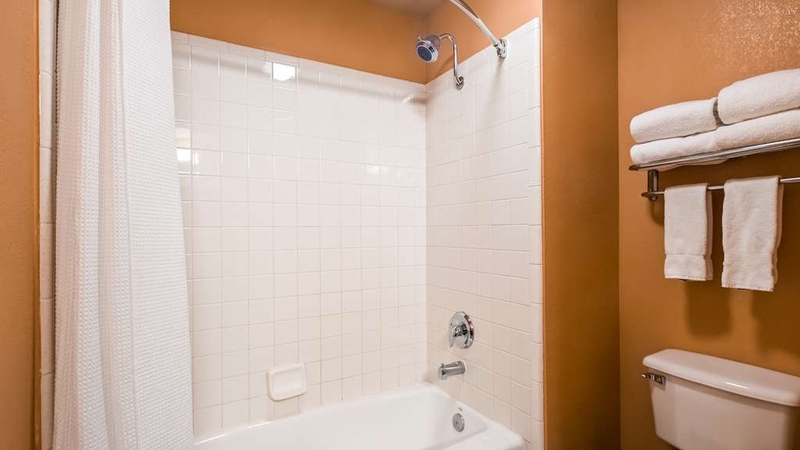 Money should be spend on fixing smell in rooms and not putting fancy tile in bathrooms. This hotel was clean and well kept. The front desk made check in and check out easy. They answered questions and gave suggestion. Would stay at this hotel in the future when traveling to or from Southen California. Worst Best Western I've ever stayed at. Room stunk and bathroom was not clean. Free breakfast was more of a continental than a full breakfast. Kitchenette area (for breakfast), garbages were falling onto the floor. Fridge didn't work. I plugged it in the other outlet and it worked. Microwave wire not long enough to plug in. Hot and cold faucets reversed. Very noisy air conditioner. Service staff were nice and the location was good. "Time for an update (remodel)"
Hotel is VERY outdated, when I arrived the lobby was not inviting, out dated and had a smell the smell the carried in to the room I stayed in... During check-in the person behind the counter was at times very sarcastic and treated me as if it was a privilege to be staying.. Room I stayed in, it was a chain lock, which was screwed to the door frame, which was coming off. Bed mattress was hard as rock which caused a not so sleep.. I could go on and on... but enough said... wouldn't stay again..
Clean room, nice pool, easy to get to. Close to Hwy 101, restaurants and basic shopping. Price was fair and staff was very nice and helpful. Definitely recommend if you are needing a place to stay in this area. This place is very attractive and perfect for an over night. We even had our dog with us. Staff was great. Room was beautiful and clean. No more needed. Well, then on top of a great room, we had a healthy breakfast...even eggs! I felt it was expensive for its location and pet fee was $20.00 per pet. Usually pet fee includes 2 pets. Not close to restaurants. But the service and personel were nice. The refrigerator and microwave were appreciated. Very nice place to stay, Lovely pool area and an absolutely huge room. Easy access to the freeway and the location was great. Very close to town and many nice restaurants are nearby. Did I mention the giant room. Very nice hotel for the price! Great location for both Point Arena and the Redwoods, that was the reason for our stay. Plenty of wineries and even a brew company to past the time. Long drive, but who cares with the great views of vineyards and beautiful trees. Hotel in general seemed shabby. We stayed because they allowed pets. Room seemed dirty Not vacuumed well. Bed was comfortable. Breakfast was poor. Not as good as other Best Westerns on our trip. would try a different place next time. We stayed at a hotel a half a block away (super 8), the past two years. This Best Western, was far superior. It was only $20 more. We felt safer, it was cleaner, and staff was friendlier, bed was more comfortable, and it had a refrigerator and microwave. It will never be a question of where we will stay in the future. Only downfall, no close by resturant, but they had an excellent breakfast right in the lobby, included. "Good nights rest in Ukiah. " 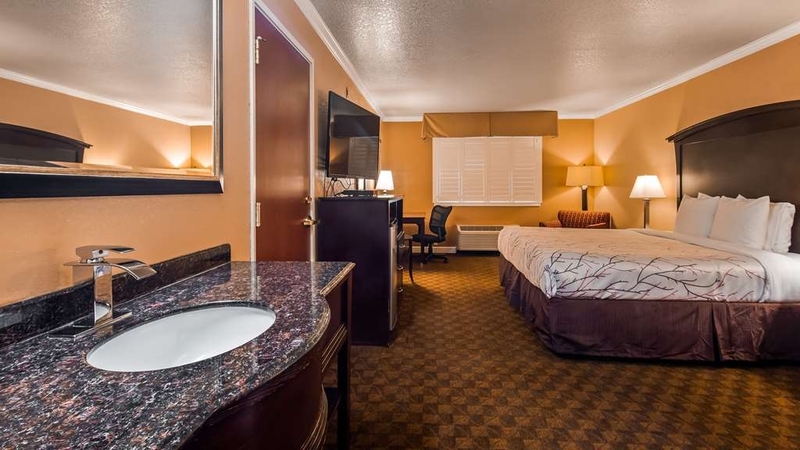 My wife and I were in Ukiah on business and decided to stay at the Best Western Orchard Inn. We had a room on the lower floor. The room was quite and the bed comfortable. We ate breakfast there before leaving in the morning. There were several hot dishes available as well as the usual cereal, bread and rolls and some fruit. All in all a good stay. "The hotel is fine, get some better service staff"
Get some better breakfast options . Compared to other BW Hotels this one lacks. Dry wrong eggs, no coffe at most points,it' like eating left overs , for the most part the front staff is very good, the morning staff seems to sit one there phones. The hotel is much better since they renovated. The staff not quite up to par but overall it is a good hotel in the area. Room is very clean and comfortable with all the usual amenities of BW. Easy on an off the highway. Minutes to downtown with very good restaurants. I spent an extended period of time at the Best Western Orchard Inn. The hotel has an excellent location, easy access to the 101, the staff are friendly and courteous. The rooms are comfortable and clean with special attention to detail. The grounds are well maintained with numerous video cameras overseeing the parking lot and hallways. I felt safe and well taken care, waking up to an assortment of options for breakfast. 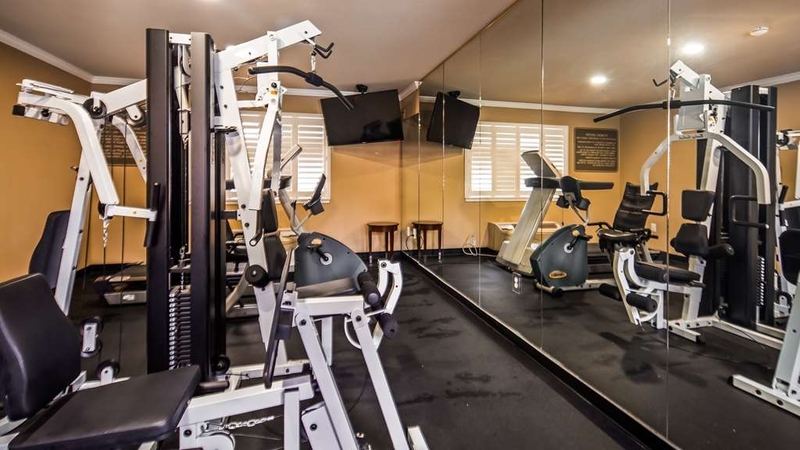 The hotel offers a laundry facility, pool and fitness facility. I have to acknowledge the efforts of one person, Ron Likhar, working at the front desk, assisted me with a a botched reservation,took the time to track down and straighten everything out, I have high regards for this person, taking time out of his busy day to address the needs of his customers, it was nice to see someone go above the call of duty and show such professionalism. I will continue to stay here when I am in town. For the best service please see Ron at the front desk, he is knowledgeable, professional, hard working and a true asset to the team there at best western and will go to extra lengths to see that your stay there is an enjoyable one. I traveled with two teenage boys. So having full breakfast in the hotel it's very convenience. They also have cookies in the lobby which is a plus. The hotel it's right off 101 freeway but we're in the back of the hotel so the noise was not a problems. Not the best Best Western I've ever stayed at. Staff was undertrained and room security was an issue. I entered my room at midnight and less than three minutes later, I heard the door lock whir and a man entered my room, said 'Sorry, wrong room' and left. Very suspicious. If it had been me entering the room, I would have asked why there was someone in my room. Again, very suspicious. We enjoyed a clean, spacious and attractively decorated room. Best Western furnished incorrect directions published on the Internet. The room was dimly lit, which bothered me, but not my husband. Thankfully, there were good reading lights on either side of the bed. The bed is comfortable, but the pillows are thick and not very soft. The bathroom fan is noisy and there is no light light furnished. The breakfast was good and the server friendly. Do not trust front desk when they say the whirlpool hot tub is working. It does not as in many franchisee owned hotel, made dysfunctional to save money, covering with lies. Disappointed by false promises from 3 pm that it is working. I just stayed one night, the room was vary clean and the beds were ok, not the best, if you like firmer beds then you may like these. The employees were vary nice and the free breakfast was decent, complete with a pancake machine. I highly recommend this hotel. One thing to note if you arrive late, there are not a lot of restaurants in town open past 9pm. "Quick stop for one night"
We just stayed here one night on our way to San Francisco. Fine for only one night, especially since we used BW points. We had a good sized king room that had an easy chair and fridge, and the sink was in the room apart from the toilet/shower area. Breakfast was adequate and is in a small area off the lobby. Since we were only here one night, and there is no elevator, we appreciated that we were in a ground floor room. Very noisey due to the freeway outside your window. Very outdated and run down. The vender area had been ripped out and was just bare walls. No elevator only stairs. Room was still being cleaned when we went to our room after checking in. Breakfast area very awkward and tiny. Only one person could fit at a time. They checked us in - put us on the 2nd flr, no elevator ... struggled to get luggage upstairs, opened the door to our assigned room & it was totally tossed - Had not been cleaned at 3:30pm - called the desk a very nice lady came up to see - she was of course embarrassed, took pictures while we waited to receive another room. Finally in the new room ... toilet sounded like an airplane taking off, lamp shade between beds was scotch taped up and once the light was on for 1/2 hr it fell & dropped! hair dryer did not work ..... all in all, it was a disaster. Must say the employees were pleasant but I was not even offered as discount & was paying top dollar - could & would never stay there or recommend this worn out old place. The service and the staff were excellent.. the room's are a bit over priced , and the location , was more in a family neighborhood, but we found our way around some,and the staff was also very helpful with directions to shopping, resturants, and sites to visit..
it was not the best Best Western we have stayed at but the quality of the room you would expect at a Best Western. the breakfast was also very good. the location for enty and exit could have been better. we alway try to stay at best western for the comfort of their beds. The pancake maker was broken the young women was trying to fix it. She was on the phone trying to get someone to help her with it. When we checked out the young women at the front desk said cookies were complimentary so they were very good. Loved the check-in staff and service. Hotel seems like it's been reconstructed since my last visit. I guess this is where I will be staying from now on everytime I'll be in Ukiah. Thanks for the discounted price Ron. nice experience; will stay again; convenient to our home when travelling out of area... our go to location when travelling south! we often travel to San Francisco Bay Area and/ or Sacromento Area and have also stayed at BW in Auburn CA. I checked in late at night and was greeted by a charismatic gentleman named Ron that some friends had told me about. The check-in process was very quick, and he even helped me carry my luggage to my room. In the morning, the breakfast had a lot to choose from. I would be back again. we arrived a little early for check In. We arrived at 1:00.. Upon entering the building my spouse saw no one, and announced he was there. A young blond came from the back, tucking in her shirt. He proceeded to ask about checking in early, at which they did accommodate. However we called several days ahead (twice)to make the reservations (which included two little dogs) there was nothing indicating in the bill that we had pets. And the original quote would be more. My spouse came out to the car to tell me this. I decided to go insid. As I approached the counter I simply asked the young lady if I could speak with the manager. The young lady responded with "you guys are over reacting". All in all she was just down right rude. Our room was not ready as she said it was, so we waited outside for housekeeping to finish. There was a small rock or pebble in my bed. The hot and cold water in the sink were backwards. However on a good note, the bed was comfortable. The hotel was quiet. Breakfast was minimal. We had a little trouble with our tv... It was a new smart tv, I called the front desk and Ron came up and helped, even went and found us a new remote. He was extremely professional and friendly. No elevator... At least I could not find one. This is an okay place to stay. Nice TV and the microwave and fridge were unexpected pluses. And I was glad to have a Kind Bed in the handicapped room. But that room was right next to a staircase, and we heard the thumping of feet on the steps late into the night and early in the morning. I'm never staying in that room again. Stayed here for one night. The rooms are very nice and roomy. The breakfast is just ok, not a ton of to choose from. The pool was very clean. It has 2 floors, but no elevator so if you have someone with you who cannot climb stairs make sure you get a lower level floor. would recommend this to others, Everything was smooth and nice and comfortable.Kindall was very helpful and all the staff was very nice and accomidating- thank you all ! We will be in touch the next time we are in the area. Over all the hotel is very nice & with tweeking can be a great hotel. It is managements job to provide its staff practical locations to safely smoke. I was clear on my billing request however it was quite late at night and mistakes happen so hopfully my card being missed billed was an isolated incident. I had emergency oral surgery and had to stay overnight unexpectedly. I was very glad they had a pet-friendly room and reasonable rates. The staff was efficient and kind. The room was nice, and I was able to rest and recover. Checkout was very easy. This is a clean smaller Best Western. The staff is polite and helpful. It was also reasonably priced. The breakfast had the normal selections and was kept well stocked by the attendant. Room was large and bead was comfortable. "Great rest. 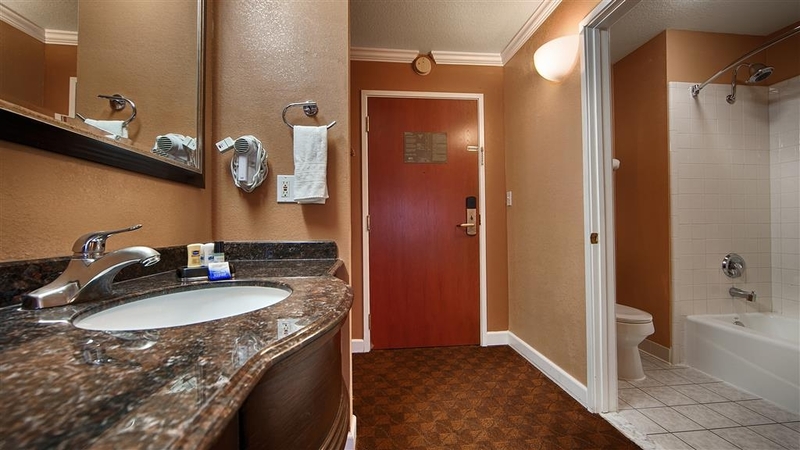 Clean and spacious rooms"
Nice to get a surprise when staying out of town. I stayed in 4 different hotels in a 4 night trip. This was by far the best room, the largest room, the most quiet, and an extremely comfortable bed. I'll be back! "Convenient stop on the way to the Redwoods...."
Tucked off 101, the Best Western Orchard Inn is a convenient stop on the way to the Redwoods or Lake County. Several blocks from downtown Ukiah, CA and minutes away from HWY 101. The property appears to be renovated fairly recently. The Lobby and Breakfast area a bit small, but functional. Plus a pool and fitness room. "Great value - great hotel!" This entire stay was perfect! I love booking through the Best Western app for an easy hotel locator and price check. This was a great value with clean, comfortable accommodations. The breakfast was presented well and had lots of options. Although I didn't use the pool or the weight room, I did go check it out and would use in the future if I had more time. Beautifully and tastefully furnished rooms, more elegant than would have expected. We got in at 1am and had to leave by 9:30 in the morning. We were more than pleasantly surprised! I had my 95 year old mom with me and even she was impressed! Nice hotel,clean and quiet,nice breakfast : breakfast sandwiches , waffles, fruit, cereal, pastries. friendly staff, nice spa area, updated rooms, free limousine service takes you to dinner and brings you back to hotel. It was a pleasant surprise for the price. This hotel is a fair standard and quite good for a one night stop. It's near to shops and restaurants and makes a good option for breaking a long drive down to easy stages. The breakfast room is too small to accommodate all guests at peak times. On the other hand, this shortcoming led to us sharing a table and a friendly interlude with some other travellers. There was nothing wrong with this property. It was generally clean and the breakfast choices were in line with Best Western's typical fare. But on closer inspection, the property needs better attention to detail. Our window had no screens, so it was unwise to leave the window open and invite in all the mosquitos and other bugs despite the cool temperatures and clean air. The pool and hot tub were green and the hot tub foamy and oily in mid-day, so it wasn't because a whole day likely elapsed since the recent cleaning. There weren't enough tables to accommodate everyone at breakfast, and there were no napkins in the tabletop dispensers. None of these things (with the exception of the pool/spa) are terrible, but they reflect poor management and over-aggressive cost-cutting. It's silly, really, since it cost the hotel more for me to run the A/C all day and night than it would have cost them for a screen. I don't expect the Ritz Carlton when I stay at a Best Western, but I found this one to fall short of where it ought to be. "Not terrible, but don't recommend it unless you must be there"
We are Best Western rewards member so we stayed only at BW hotels during this summer's west coast road trip. This one is the most expensive and worst performing BW hotel amongst the three other BW hotels we stayed. It is not a bad one which you must avoid at all cost, but if you have other choices, skip it. Pros: The location: convenient, right off 101. It is a BW, so it is like going to Starbucks, you know what you to expect. Good wifi. Cons: The price: perhaps the location makes it so costly. It is not worth paying over $200 to stay here. It is a very basic motel. BW website rates it as 3 stars. It is more like a 2 star BW. The breakfast: the standard BW free breakfast but unfortunately both of the coffee machine and pancake machine broke on the morning we had breakfast there, and I did not see any hotel staff make any attempt to fix the problem. The room: smells strange. A mixture of cigarettes and wet dogs and cleaning products. (We were in the non-smoking room. We were told upon check out that we needed to request a room far away from the smoking area if the smell of cigarettes really bother us. I had no idea we had to do it as a special request here. ) the bathroom fan was super loud. Whenever we used it, it was like an airplane flew by. The corridor: looked beat up They moved the ice machine to a different location and left a big dusty pipe hole uncovered on the floor. No elevator. Overall, it was not a terrible stay but not a good one. The description of this hotel was very charming on the BW website so it was very disappointing to see the real deal. Both the evening and morning staff working the front desk were outstanding. They were busy with guest, breakfast, both cooking and serving, helping guest with requests even finding an empty room where I could dry my hair as the dryer in our room was not working all the while she was very busy with check outs and breakfast. "Easy location, really basic. " In Ukiah for three days, two nights and I'm a rewards member so I booked through Hotels.com. Two-story, no elevator but indoor walk-up. My room was fresh, clean, well lit and was more than suitable for my needs traveling alone. Clerk allowed me an early check-in and personally went to make the sure the room was ready, excellent service upon arrival. This was a nice place to stay, but the hallways were hot and the hot tub was Luke warm. The staff was friendly. The bathroom had hair in the shower, but I just rinsed it and we were fine. The food was mediocre at best. The wifi worked well. There is some noise from the highway, but it wasn't enough to bother us. We would stay there again. lobby was nice. The front desk service was adequate. The room had plumbing tools and parts left in the bathroom. The carpet had a tear and the carper threads were all around. The hot tub was smelly and green. The pool had been redone and was nice BUT I booked this place because it was close to the freeway and it had a spa. Linens and other amenities were satisfactory. Linens were fresh, clean and great quality. The towels were soft and large. Internet was easy to get on, fast and no drops. Has a pool and a fitness room (I did not use, but appeared from a glance was clean and a plus). The girl at the front desk was rude and unhelpful and made it very difficult to change rooms when the original room she gave us did not meet out request for a quiet room (she gave us a room next to the stairs and the laundry room). "Sometimes a smile goes a long way." We had people who smiled and made you feel comfortable. Everything was clean and the amenities were good. 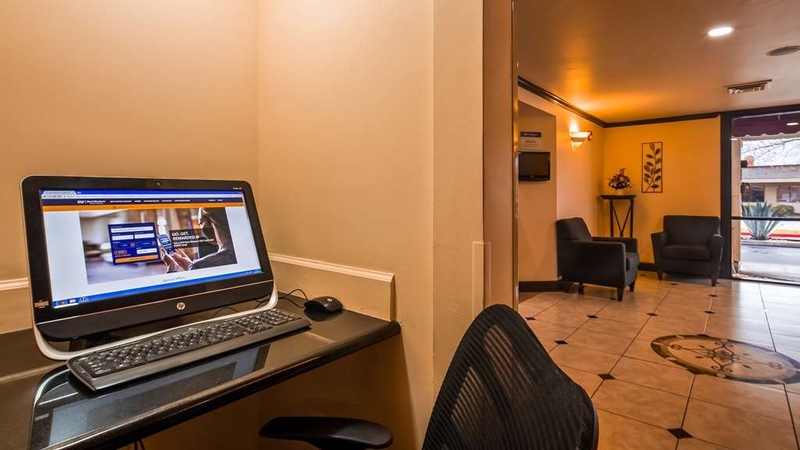 We enjoy Best Western's points and easy online booking system. In the past if we had problems the staff listened and took care of the problem. Tough to sleep through the night. The Bed was as hard as a rock, As for the Continental breakfast, it was none existent. Other then some gue that resembled oat meal. Grabbed a yogurt and ran. Rooms smell stale. This hotel was clean and the beds were comfortable. There was a small pool and fitness room (unfortunately I did not get to try either!). It was close to everything, reasonably priced and had ample parking. It was reasonably priced, and came with free internet. The 2 bed rooms were spacious and the hotel is pet friendly. 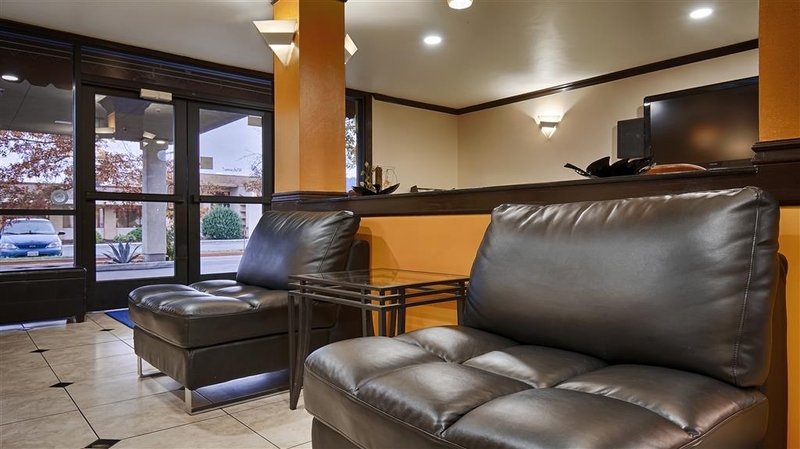 "Excellent comfort For The Money"
My wife and I have stayed at this Best Western for years because we like the comfort, quiet, and service. The employees are respectful and very accommodating. European breakfasts are not exceptional but there are some good home cooking restaurants nearby (within walking). I stayed at the Orchard inn while I was going through the process of moving to Ukiah. I ended up staying for 1.5 months. I have to say that the service was great, and my room always in top shape! Staff was always friendly and willing to help out and answer any questions I had about the community and places to eat. When I was moving my luggage into my room (and there was PLENTY of it), the front desk clerk offered to help me get it all in. I don't know if he is still there (Don...Ron? )....but I have no doubt the professionalism of the staff remains. I had the opportunity to change to a different hotel when I had to check out for a week...but I chose to stay at the Orchard Inn until I was able to move into my place. I would recommend this hotel for any of my friends or family in the future. Stayed 2 nights. Staff was inexperienced/new and did not know answers to simple questions (how to get reward points) but were friendly. Looks like hotel may have been redone recently. Room clean & comfortable and has fridge. AC unit very noisy. Room overall seemed to be noisy but hotel was full. You do get a clean TV remote which is nice. Breakfast included (cereal, yogurt, fruit, breads, sausage, pancakes coffee, juice). Has pool but did not use. If in area again I would consider staying here. Not much to do in town. Mendocino about 25 miles away but over 1 hr drive. Good wineries close but head to CA 128/Philo if you are a wine buff. Our room was very large and very clean. The bedding was comfortable and the room temperature was pleasant. The front desk staff was not very professional and the breakfast buffet was ran out of coffee, pancake mix and syrup. However, it was replenished in a timely fashion. Stopped here for a night so my wife could visit the City of Ten Thousand Buddhas. The place is simple, basic and does what it does perfectly at a lower price than the Hampton or Comfort Inn. Very good-sized room with a great big-screen TV (the website says 32" but ours was 44"), refrigerator and microwave... very clean, no dust, no carpet wear. Mattress quite firm but very comfortable. The shower is absolutely fabulous... wish I had that kind of water pressure at home. And crucially for the business traveler, great speed on the wi-fi. Hot breakfast choices are limited -- pancakes, eggs, sausage -- but very good. And again, for the price you can't beat it. Advisory: the place sits perpendicular to the freeway, and the east end with the higher room numbers is likely to have highway noise. (The noisy guest coin-op laundry is at that end too.) We were in 204 and it was very quiet. Most important was the comfy bed that wasn't the normal stiff worn out ten year old mattress. Very clean. Even air filters on the air conditioner were clean and I never find that. Air worked very well too. Larger room than most I have stayed in. Receptionist was friendly and very helpful. Another town, another Best Western, and I drove away happy. Little issue with the check in staff being attentive and friendly, but the rest of the stay was entirely enjoyable. Good value and a very nice place to stay. Quiet and comfortable. Advertised as "Pillow Top Mattress". More like board covered with fiber fill mattress pad. The room was reasonably clean but there was a lot of noise from other guests working on cars in the parking lot. Breakfast selections were poor and under stocked. This is a "bare necessities" hotel. That is all you will get for your money no matter what they advertise. Perfect launching point for wine tasting in Anderson Valley. Enjoyed a wonderful experience at Navarro and Roederer. The picnic area at Navarro Vineyards is serene and peaceful. Many more wineries are available but we were headed out to Mendicino for quick visit . "Spacious room and nice breakfast"
Very nice motel, definitely an updated one and tasteful decor. They have mini fridge, a microwave, an exercise room, a pool with jacuzzi, though we backed out of the jacuzzi as it looked dirty. The complimentary breakfast is awesome, had scrambled eggs, sausages, ham, pancakes, and the usual cereals, bread, fruits, coffe and juices. My only complaint about the room is they failed to look up when they clean the bathroom as the vent is really gross while the rest of the room is immaculate. Wifi is good, too, my daughter never complained, so that's another plus. "A last minute choice--and a good one!" Clean, well decorated, and friendly staff. Impressed by the size of our room! So nice to have space to spread out. Didn't have breakfast, but that was just because we were weary of motel breakfast spreads. Would definitely return if I'm every in Ukiah again. Very nice hotel. Staff is courteous and helpful. Hot tub was great. Very clean room and lobby. Decent breakfast... Loved the pancake making machine. I want one! Push one button, then 2 minutes later out pops a fresh hot pancake. "Nice Place for the Night"
I stayed here for one night with a friend following a late meeting. The staff were friendly and helpful, and check in was easy. The room was large, clean, comfortable and had everything we needed. Breakfast was adequate for me, although I'm not a breakfast eater. There was coffee available any time I was in the lobby, and it was actually good. They did have sausage, eggs, pancakes, juice, toast, English muffins, cereal, yogurt available. Affordable. When my wife and I arrived last Wednesday late afternoon we were greeted by a male desk clerk who sexual harassed my wife every time she would pass the lobby alone. We waited waited until another clerk came in to file a complaint against him because my wife was afraid to even walk pass the lobby. A young lady helped us with the complaint and apologized. On the day we were supposed to check out (check out time is at 11 by the way), we received a knock on the door at 8 sharp waking us up to check if we had left our room from a maid. Very unprofessional! The breakfast service was excellent but I can't say the same for the food itself. The phone in the room wasn't working, we had to use our cellular phones. To many people coming and going all through the night next door to us. When we finally checked out a young short man was at the desk and he was very polite to us so we tipped him $20 for his excellent service at breakfast and checking us out. The morning clerk Kindell was so rude I asked her to bring me more towels to my room and she told me she was to busy and that I could come to the front desk to get some when I went to the front desk she was on her personal cell phone talking to what seem to be her boyfriend yelling at him!!! When she got off her phone I told her that I thought it was not good service to not bring me towels And I in fact had kids with me and I was very busy I will never stay here again management needs to look at the staff they hire!!!!!!!!! Not bad. Good value. Pet friendly, ADA, non-smoking, room was what I sought and got. The only downside was "smoking stations" right outside of exits. Where I live you can't smoke within 25 feet of buildings but I guess that is a local law. "The Definition of a Roach Motel"
Worst hotel stay: when I arrived early before check-in the lady at the front desk was on her phone didn't realize I was standing there until I said something and when I entered my room I saw multiple large cockroaches on walls, floor and bed, a dog barking all night next door and children running up and down the hallway middle of the night. I did complain to the front desk but nothing was done about it and I even asked a different lady that was at the front desk at the time If I could be moved to a different room but she was just rude and told me no. I never in my life wasted my money on a nightmare. I wouldn't recommend this hotel to anyone even with all the "Good" reviews it's been getting because the employees aren't professional enough and yelling around like children. the room might look nice but cockroaches live in them with people who's on drugs next door and the breakfast isn't that great. I would recommend Comfort Inn than Best Western anytime. "A comfortable place to stay & priced right"
Had to have service work on car. Chose to stay at the Best Western Orchard Inn. Room was spacious and got a great night's rest. Staff helpful and served a generous breakfast. Room is very quiet even tho location is near freeway. The staff was very polite and helpful, the bed comfortable, breakfast the typical fare. The room needed some cleaning along the edges and in the corners. Appreciated the pet friendly policy. Getting into the parking area could be a problem for large vehicles or those with trailers, would recommend scouting it out before starting down the drive to the registration entrance. Staff shipped the computer left in the room, very accomodating service. Do not stay in Room 101, it is next to building entrance door and it made noise. Stay in rooms on west side. Property is next to freeway. We noticed that they try to put people on that end, so that is good. "Very Spacious Rooms and Extremely Comfortable Beds!" I was impressed by the spacious room and very comfortable beds! We slept so well! Breakfast was included and I was happy to see that they had oatmeal with dried fruits and mixed nuts, as I am on a plant based diet so I don't eat the usual eggs, sausage, etc. But that was there also for those who prefer those foods! The front desk was also very attentive! The room was clean, but not updated. The wifi was good and the connection reliable, but there was no clock and no USB connection for miscellaneous techie devices. It's a no-smoking facility, but there were cigarette burn holes in the bedspread and one in the curtain. The BIG problem I had was the scented something-or-other that permeated the hallways and the room. I wheezed all night, even with the window fully open (yes - the second floor window opened all the way! Goodie!) Maybe it is the cleaning fluid; I don't know, but it would prevent a return visit from allergy-sensitive, asthma-active me. "Great Stay, Great Customer Service, Great Hotel"
Traveled with a group of 13 for a local high school basketball tournament 12/3 - 12/5. Sariesa made the check in process simple considering we had multiple rooms and multiple needs. We we're one of 3 teams staying at this location. The owner's Al, and Mike were super friendly, and ensured we had a great stay. From feeding our guys, to providing us with an area to gather for meals and meetings. The free continental breakfast is a real value. It's more of a full spread for breakfast, not a simple continental breakfast as thought. Eggs, hashbrowns, pancakes, fruit, yogurt, etc. Darleen sets up breakfast and it was always warm, and there was plenty to eat. The rooms were clean, updated, and very comfortable. The location is perfect. 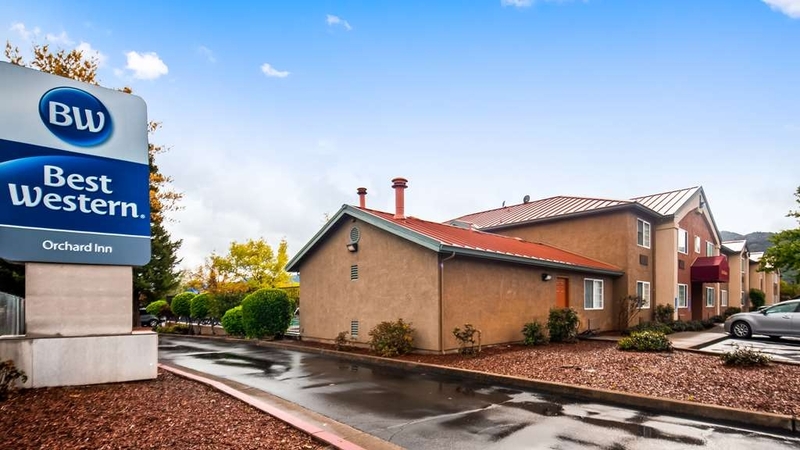 Right off the freeway, and within walking distance to various restaurants, and a Safeway. Pool and hot tub were clean and in great condition. If you are going to stay in Ukiah, this is the place. "Beautiful room, otherwise just OK"
I am a Best Western Rewards Member. Made my reservation in a phone call to the hotel. I used my BW Rewards number for the agent to look me up. She never said my name. When I checked in the next night, she never said my name. When I checked out in the morning, the nice young man, never said my name. I remained anonymous Now that is personalized customer service! It makes me really want to come back to that hotel. On another subject: 1. Neither agent could break a $20 bill. 2. The breakfast was unappetizing microwaved food. And let me tell you, there is not much more unappetizing than microwaved sausage. 3. Check out time is 11am. The housekeeper knocked on my door at 8:30am. Then I heard her go down the hallway knocking on other doors. Totally not a good thing. I am so thankful for this hotel the front desk clerk Sariesa Boele was so nice she helped us with all the directions in town a great recommendation for dinner (Crush) and everything else we needed she was there with a smile and more then willing to help also the rooms were very clean and we will definitely be staying at this hotel again thank u for exceptional service hats off to management for having such a great crew!!!!! "Clean, comfortable, right off the highway"
Everyone I met who worked there was very friendly and helpful, including the guy at the front desk who checked me in. The room, halls, and property in general were very clean and the hotel seemed new-ish. The bed was comfortable, and the thermostat actually worked well to keep the room comfortable without having the heating (it was November) unit be too loud. The only complaint I have, that keeps it from five stars, is that the walls are a bit thin. It wasn't difficult to hear the couple next door to me... but that's why I travel with earplugs. "Like Losing an Old Friend"
We were sorry to see the hotel deteriorating. We feel like we've lost an old friend. The Orchard Inn has been our "go-to" place when visiting the Hopland area wineries. Unfortunately, we'll be looking for a new home. The rooms were run down with lumpy pillows and sagging mattresses. The shower was lukewarm and the bathroom tiles were chipped and cracked. The towels and linens were musty. The desk staff was efficient but completely unfriendly. We skipped breakfast after seeing that it looked plastic and unappetizing. We're sorry to see you go old friend! I only ever stay at Best Western's when I travel. This is the worst one I've been to. Shortly after I walked in, the clerk answered her personal phone and yelled at who I assume was her boyfriend. The outside pool looks sad. The walls and floor are incredibly thin. I can hear multiple tv's on, and people talking. Plus I can hear the people above me walking. Parking lot doesn't seem secure. The fruit for breakfast looks like rejects. The room smells weird. Just avoid this one. There's a couple hotels nearby. If you're set on Best Western, there's one maybe 30mins south in Cloverdale. I think there's one north in Willits too. "Worst Customer Service... DON'T WASTE YOUR TIME"
DO NOT STAY HERE!! If it were possible, I would give this 0 stars. Never in my life have I experienced such rude costumer service. After a very draining and long day, dealing with a family emergency, we needed a place to sleep for the night. On Best Western's website the room available was listed at $98.99. I called the hotel directly to make the reservation. He quoted me a higher price. I asked if he could honor the online price. No, he could not. He could not match an $11 difference. There's nothing he can do about it. Ridiculous!!! We live in a world where nearly every company is making it easier for consumers and find ways to match online pricing. Especially when it is a price found through their own company. But okay, I'll make it online. I went ahead and booked the room through hotels.com because the Best Western site was not working. We arrived at the hotel around 1130 pm and were greeted by a very disinterested Alpesh Jivan, the GM. The greeting: "so you're the one that called." Not quite the greeting I expected. And this was not said kindly. Ignoring his lack of politeness I let him know I booked our reservation online and we'd like to check in. He proceeded to tell me that he didn't have anything. The way he spoke was so incredibly rude. I brought up the confirmation on my phone. He didn't even glance at it before he told me there was nothing he could do. Was this a joke? A general manager can't help me?! It was late, we were exhausted, we just wanted to sleep in the room we have already booked and paid for. Seems like a very simple request. There were zero attempts on Alpesh end to help find a solution to the situation. We didn't even get as much as an "I'm sorry, let me see what I can do to get you into your room". Just eye rolls and defensive, rude comments on how he won't be able help us. So I decided to call hotels.com to see if they could assist in getting the reservation through. Something, I'm sure, he could have done to help the situation. While I was on the phone with them, Alpesh continued to argue and be very disrespectful. Hotels.com had to call Best Western and speak to Alpesh. We heard him speak to the representative with the same condescending tone. After hearing him tell her we were being rude to him, we had enough! Asked him, very polity, to send her back to my line so we could cancel the reservation. Thankfully hotels.com cancelled the reservation with no issues. And we drove down the street to Fairfield Marriott. Booked a nice room for $159.99/night. The customer service was great! I honestly would've paid money not to stay in this hotel. We have both been in customer service jobs. And part of the job is trying to make the customer happy. Even if there really was nothing he could have done to help, he could have tried. He could have been kind and spoke respectfully and made some sort of attempt at figuring out how to let us into our room. The one we had already paid for. From the moment we walked through the door, he had a chip on his shoulder and he was not about to brush it off. He made it very clear that they did not want our business. While we only booked the room for the night, we likely would have been staying at least a week. There are definitely much better hotels to stay at. Hotels that offer much better customer service and would gladly take your reservation. Do not waste your time at this one! It was our first visit to the States and we were exploring the Pacific Northwest. On our journey from San Francisco to Seattle we made the first stop at this hotel in Ukiah where we were greeted by Johnny Depp look alike named: Ron. The service was excellent and the rooms were clean. Would definitely recommend this hotel to our European friends. "Group booking mistakes, loud lobby, bad management behavior. " After multiple attempts by our set of seasoned veteran travelers in our group, the management booked the wrong nights, insisted that we had not booked a suite we needed, and then, even though they turned out to be mistaken on their parts,they bad mouthed me to two other members of our group during their efforts to correct the mistakes that this hotel made. This was very unprofessional and uncalled for. I never insulted them nor did I use any profanity in my initial attempts to find out why we did not have the correct booking- even though later- it turned out that we actually did have everything correct on our end. A remedy, the manager suggested was "You don't have to stay here", even though she knew our group would all be there. The public space in front of the lobby where "breakfast" is served is very small and loud. Our group experience overall was unpleasant due to the way the hotel dealt with our problem. My family and I will not be back. "A Best Western with common sense"
I rated this hotel as very good in most aspects. Clean room, good staff, good breakfast, good internet, etc....HOWEVER, this hotel has something happening that I've not seen before and I was very impressed. As we were leaving our room to go to breakfast, I noticed a group of mentally handicapped adults preparing to clean rooms near ours, with their supervising staff. I took a moment and spoke to their staff person to applaud what they were doing. She told me that they come from a local agency and clean all the rooms in this hotel, as well as another in Ukiah, CA. I hope more hotels get on board by employing people with mental disabilities to work (with supervision) in their hotels. A great to see! We have stayed at this hotel on several occasions and have always found the rooms clean and comfortable. The breakfast is always good. The fresh cookies at check in and departure are also a great touch. Service of staff is nice and friendly. This Inn is perfect location with amenities that give the comfort I desire. The breakfast is good with many choices. Being able to have my dog with us was a real plus! Local eateries are very good and diverse. "A special thanks to Ron Likhar for his attentive customer service." I had a very comfortable stay at the property. The staff were pleasant, and a special reference to Ron Likhar at the front desk. He was polite, attentive, and provided us with impeccable service during our stay at the Best Western Orchard Inn. Thank you for such a comfortable stay. "The guy named Rohit Likhar provided awesome service "
I was here for vacation and loved this place. Awesome place to stay. I made a friend when I was staying here, his name is Rohit Likhar. He was very polite and provided me with all the info I needed around this place. I really like the service I was offered here. Unfortunately, we had planned our trip during the terrible fires in this area in September. Our second night stay the hotel was packed and noisy with crying babies and barking dogs. We realize this could not be helped but it did not improve our stay. 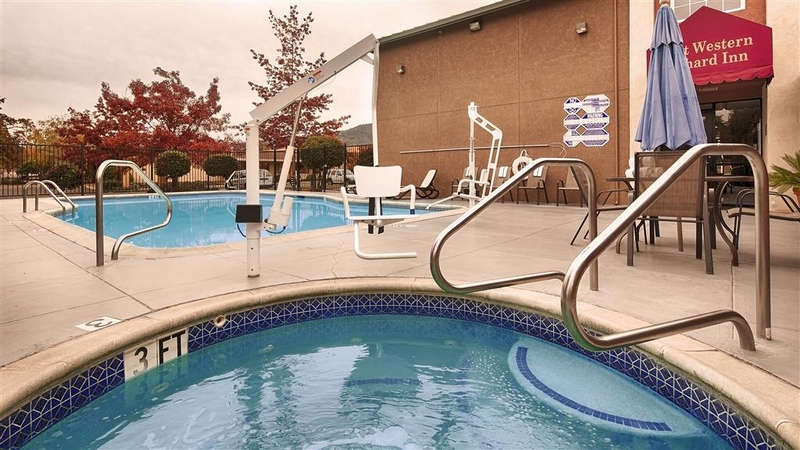 We love a good pool, and this pool was not heated and located very close to the hwy. so very noisy. Also only one table for people to sit at.